We're closing in on college football season, and there's renewed optimism around Tallahassee. People are excited for a new start for Florida State Football under head coach Willie Taggart. Doak Campbell Stadium boasts one of the best atmospheres in the country, and there are plenty of places around that bleed garnet and gold. Cheering on your favorite team works up an appetite, so check out our list of restaurants Near Doak Campbell Stadium in Tallahassee that are perfect for gameday. In recent years, College Town has become a center of activity, and Madison Social is the most popular spot in the district for gameday drinks and food. 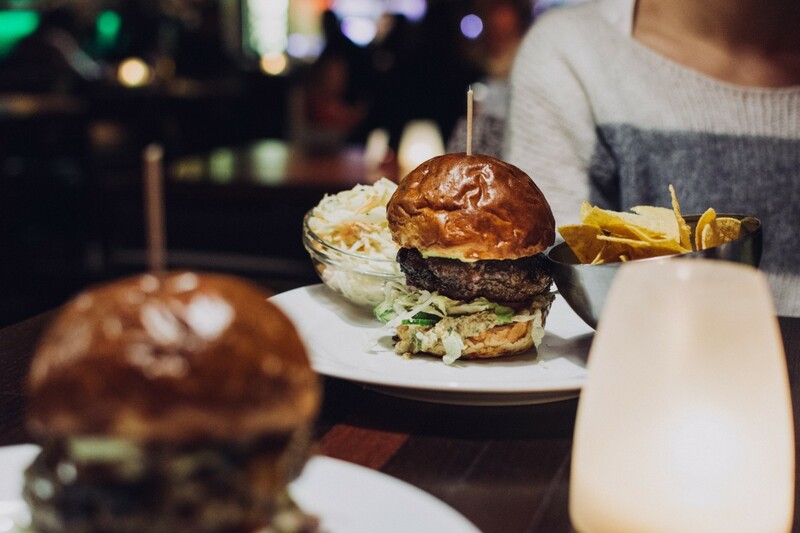 The MadSo Burger is a favorite choice here as it's topped with fried avocado, maple-pepper bacon, aged cheddar, whiskey caramelized onion, and rosemary aioli. Another menu item to look out for is the short rib taco with ginger-braised short rib, basil-serrano slaw, pickled red cabbage, and chipotle-lime aioli served on indian flatbread. If you're coming into town early or staying late, MadSo also has one of the best happy hours and brunches in Tallahassee. Directly across the street from MadSo is the German beer garden, Township. They have an awesome setting with an outdoor fireplace, retractable awning, and 32 beers on tap. The Township menu is full of delicious bar treats, including two different huge German pretzels, Nashville Chicken, and cheesesteak. Their beers are equally as large and served in third, half ,or full-liter steins. Just down the block from College Town, the best grilled cheese sandwiches in Tallahassee are made up at the daytime shop, Merv's. They also have a variety of breakfast melts that they serve all day. People flock to Merv's for their dressed-up orders of tater tots for $3.96. The top choice is the Drunken Tots that come with homemade beer cheese sauce, freshly shredded Parmesan, Old Bay seasoning, chopped bacon, and scallions. Momo's Pizza is the quintessential college pizza joint just up the road from popular nightlife destinations on Tennessee Street. The slices at Momo's are some of the largest you'll ever see, and they have approximately 45 toppings to choose from. Their slices are $4.75, and extra toppings are $0.75 each. They also have several craft and bottled beers. Also near Doak Campbell Stadium, Gordo's Cuban Restaurant is a great place to get a meal for anyone parking for the game in the neighborhoods along Pensacola St. They've been doling out perfectly-pressed Cuban sandwiches and other well-known Spanish entrees since 1988. This is a very affordable spot with only a few meals on the menu topping $10. They have a great list of drinks as well highlighted by the Gordo Smash rum punch. If you're facing an early kickoff, dropping in for breakfast about a mile from the stadium at Maple Street Biscuit Company may be the way to go. This may be a chain, but the biscuits taste like they were just whipped up in Mom's Southern kitchen. Maple Street Biscuit Company has 15 different biscuit varieties, several types of waffles, and great sides like the Smokey Mountain Mac-N-Cheese. They also have a full coffee menu to wake you up on gameday. Enjoy the perfect Seminoles gameday and give one of these delicious eateries near Doak Campbell Stadium a try. Let us know in the comments below what your favorite places are to eat at in Tallahassee before or after FSU games. Find more restaurants in Tallahasee by registering on 850area, your free guide to everything in the Tallahassee area.